Leukocyte trafficking from bloodstream to tissue is important for the continuous surveillance for foreign antigens as well as for rapid leukocyte accumulation at sites of inflammatory response or tissue injury. Leukocyte interaction with vascular endothelial cells is a pivotal event in the inflammatory response and is mediated by several families of adhesion molecules. The crucial role of the β2-integrin subfamily in leukocyte emigration was established after leukocyte adhesion deficiency (LAD) I was discovered. Patients with this disorder suffer from life-threatening bacterial infections, and in its severe form, death usually occurs in early childhood unless bone marrow transplantation is performed. The LAD II disorder clarifies the role of the selectin receptors and their fucosylated ligands. 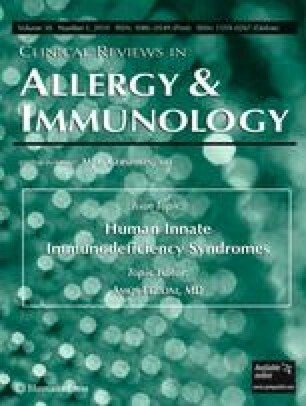 Clinically, patients with LAD II suffer not only from a less severe form of infectious episodes resembling the moderate phenotype of LAD I but also from severe psychomotor and growth retardation. LAD III emphasizes the importance of the integrin-activation phase in the adhesion cascade. All hematopoietic integrin activation processes are defective, which lead to severe infection as observed in LAD I and to marked increase tendency for bleeding problems (defective activation of β1, β2, and β3 integrins). The various genetic defects leading to all adhesion molecules syndrome will be discussed.